Twisted - ZineWiki - the history and culture of zines, independent media and the small press. 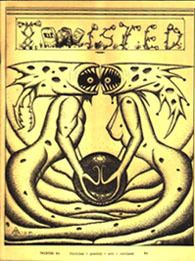 Twisted was a horror fanzine edited by Christine Hoard. Twisted was published in the U.S.A. in 1980s and 1990s. Issues #1 and #2 appeared in 1985, #3 in 1986, #4 in Summer 1987, #5 in 1989, and #6 in 1991. Contributors of fiction included Brian Adams, D. Eden Bergis, R.L. Brockett, David Bruce, Cliff Burns, J.L. Comeau, t. Winter-Damon, Keith Allan Daniels, L. David Gibeau, Joe Faust, Janet Fox (Scavenger's Newsletter), Charles Gramlich, George Egon Hatvary, Barry Hoffman, Stefan Jackson, Kathleen Jurgens (Thin Ice), Anke Kriste (Doppelganger), D.F. Lewis (Nemonymous), Miroslaw Lipinski, Bentley Little, Albert J. Manachino, Mary Ann Mitchell, Yvonne Navarro, Thomas Neveu, Steven M. Oberbeck, Thomas O'Connor, Solomon Pogarsky, Mark Rainey (Deathrealm), Ralph Rainwater, Jr., Octavio Ramos, Jr., Lenora K. Rogers, Steven Neal Schaffer, Jacques Servin, George W. Smyth, David Starkey, Marcelle Thiebaux, Roger Dale Trexler, Bobby G. Warner, and Spot D. Yost. Contributors of poetry included Michael Arnzen, Robert Baldwin, Linda Bornstein, Eryc Bourland, Carl Buchanan, C. Darren Butler (A Theater of Blood, Magic Realism), Geri Eileen Davis, Holly Day, Brian E. Drake, Wayne Edwards (Palace Corbie), Joey Froehlich, C.S. Fuqua, John Grey, Robert Haase, Jana Hakes, Dwight E. Humphries, Lisa Lepovetsky, Jeffery Lewis, Sheryl L. Nelms, William E. Passera, Jacie Ragan, John B. Rosenman, Ann K. Schwader, Marge B. Simon (Star*Line), Steve Sneyd (Data Dump), Reta Taylor, Bobby G. Warner, and Thomas Zimmerman. Articles were by David Bruce and Lawrence McCallum. Contributors of cover art work included Ray Basham (#5), and Mark Bell (#4), Allen Koszowski (#6). Other contributors of illustrations included Jon Bush, Jim Garrison and Randy Moore. Photographs were by Robert H. Bradford. This page was last modified on 5 November 2012, at 11:34.